Hi. I just got a fabulous video made by kids show magician Brian Scott. What an inventive guy! 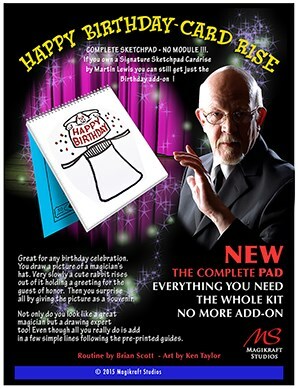 A few years ago, he transformed Martin Lewis’ “Cardiographic” (aka The Sketch Pad Card Rise) into the ultimate birthday party trick which doubles as a magical souvenir. How? Instead of an animation of a card rising out of a cardbox, he draws a picture of a tophat -- and a bunny slowly peeks out, holding a sign that says, Happy Birthday. That's a souvenir that the child will keep forever. Watch the video and I think you'll agree that this is the perfect kids party trick. With your order you get. You can make additional refills yourself or purchase for just $25/dozen. When you consider that the child will probably keep this magical birthday card with your name signed on it for years, it’s a bargain. If you’re looking for a routine that shines the light on the birthday child and will fool everyone in the room, get the Happy Birthday Card Rise. They’ll remember you forever!